At the start of the class, we decided that a short poofy sleeve would be cuter than the long one in the original sample picture, and also that it fits better onto out 8.5×11″ sample sheets. Because we adjusted the armscye of the block when we made the blouse foundation, we need to adjust the sleeve head to fit into the armscye. We need to drop the sleeve cap 1/4″ at the top for our half scale sample. Give yourself a guide on the center line of the sleeve. The book directions tell you to extend the sleeve block straight out from the bicep line (underarm level). 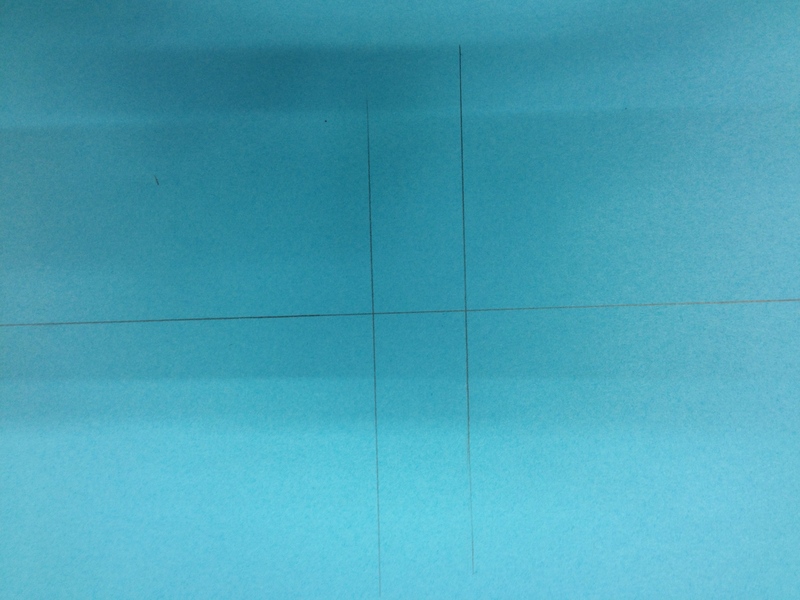 We used 3/8″. 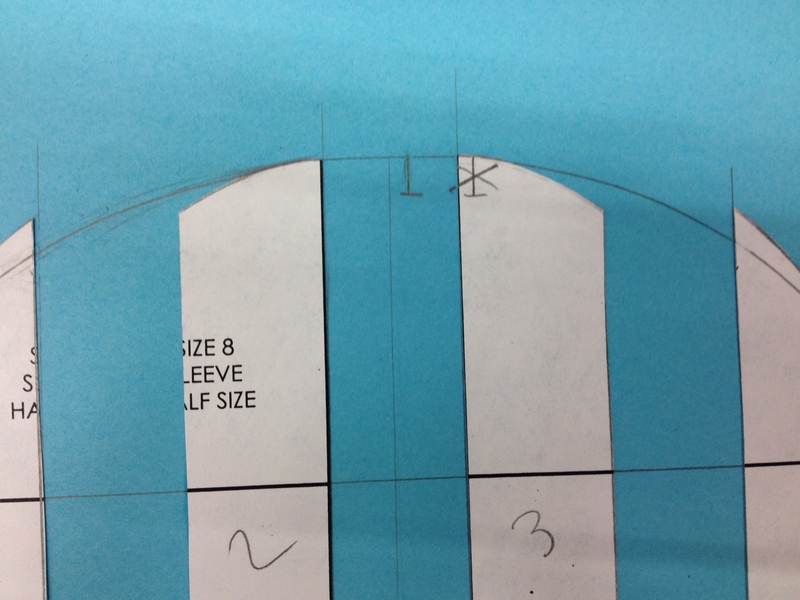 When the sleeve head is redrawn based on these guides, it is less curvy than it was before. 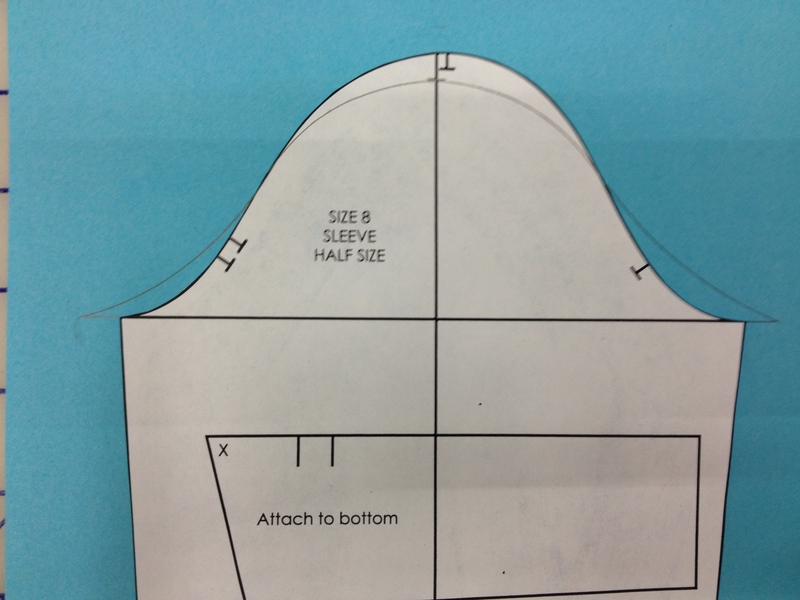 This is the shape we expect for a blouse/shirt sleeve. Except…. When we walked the blouse curve against the sleeve head curve, it was impossible to make them fit together. The armscye was significantly larger than the sleeve head. This is not good, because it will not sew well. When we say “walked the sleeve” or “walked the armscye”, we’re talking about physically placing the sleeve and body pieces together, starting at the under-arm end, and matching up the curves to check their lengths. It’s called walking because you have to do it in little steps. What you want is for your armscye/sleeve notches to match. After that, you want your sleeve to be a good inch larger (1/2″ in half scale) than the armscye it fits into. This gives you enough extra fabric to ease the sleeve into the armscye. 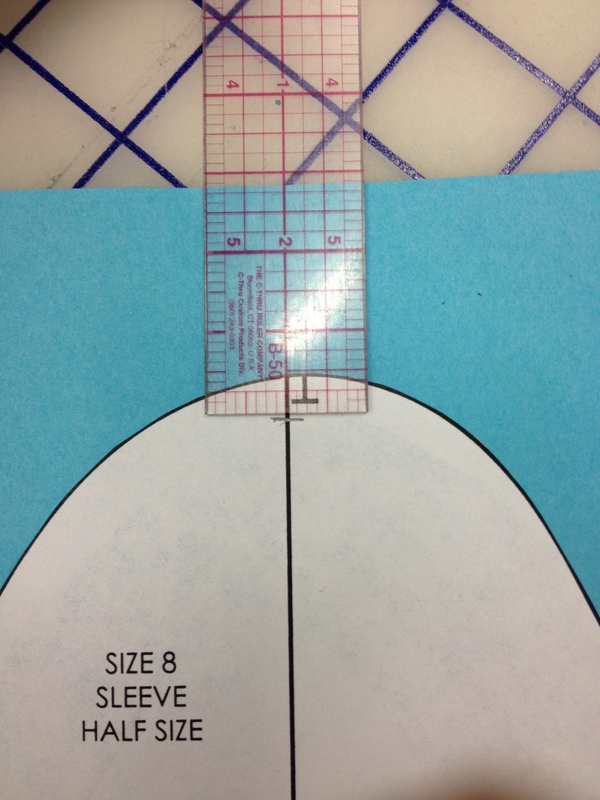 We placed out guide for the bottom of the sleeve head 3/8″ down from the bicep line, and 3/8″ out. This is what we did with the underarm area of the blouse foundation, so can safely do it to the sleeve. 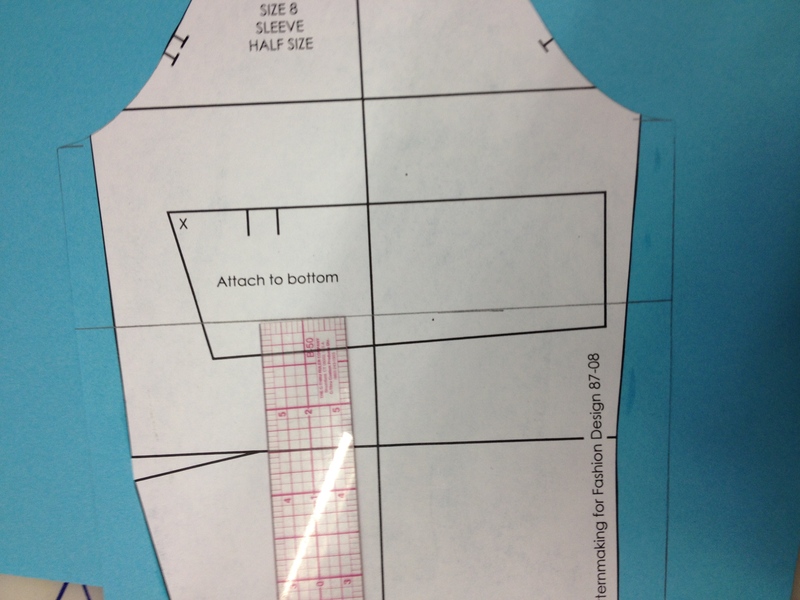 I am personally a fan of the “seams that work together get the same adjustments” school of pattern making. It feels like an intuitive rule to me, and I can only think of a couple exceptions. 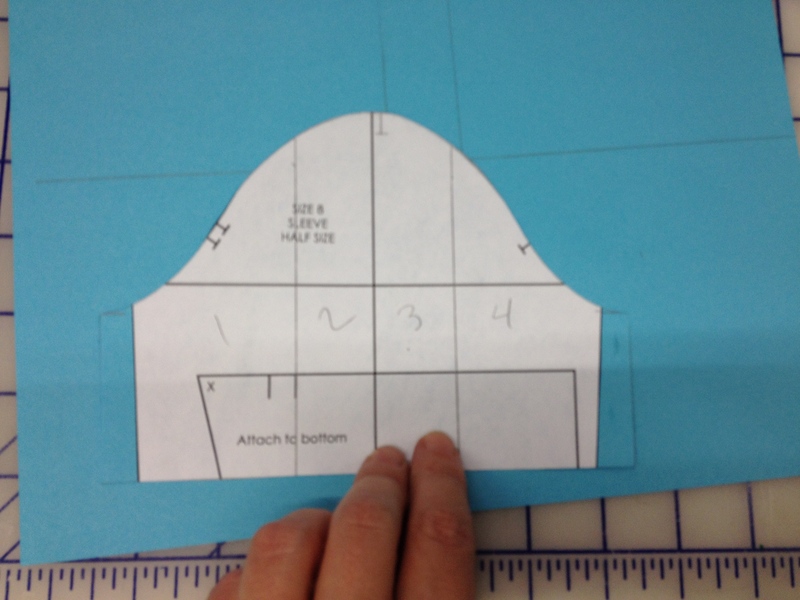 This gives us a sleeve head with more curve, which walks better into the armscye of the blouse pattern. This isn’t the relaxed shape we saw int the earlier draft, but it does do what we need it to do. Generally, the curves of both the body and sleeve in the underarm area (notch to seam) should be pretty darned similar. This makes them much easier to sew together. There are times when they’re slightly different, especially when you get into historical patterns, but we’ve mostly gotten this down to a science. We no longer do a lot of adding extra fullness or gusseting under the arm. It’s an awkward place to whole bunch of fabric when we mostly life our lives with our arms down at our sides, sitting at desks and using computers and things. Extend the bottom of the sleeve following the front bottom line. We haven’t bothered to put the sleeve extension piece onto this half scale piece, since we know we plan to shorten the sleeve. If you are doing this with a full size block with a darted elbow, this bottom line will go through the back half of the sleeve at the bottom. That’s fine; we’re squaring off the bottom. Square up from the bottom line to the new underarm end of the sleeve head. 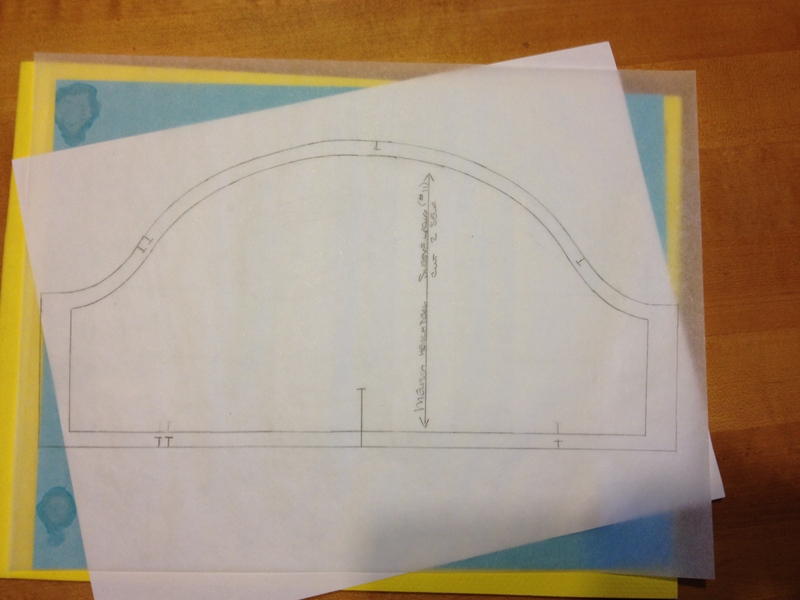 Now for the fun part… Your curves will probably require some adjusting. Cut out the sleeve on at least the top and side lines. Walk the sleeve head against the armscye curves of the front and back blouse to check the fit. Your sleeve head should match to the notches, and be about 1/4″ larger in front and back than the armscye. If your sleeve head is too large for your armscye, you have too much curve in the sleeve head. If it is too small for the armscye, you need to have more curve in your sleeve head. Now we made some styling choices. First we’re deciding on a length for the finished sleeve. Since this will be a little poofy sleeve, we decided it should end 1″ above the elbow. 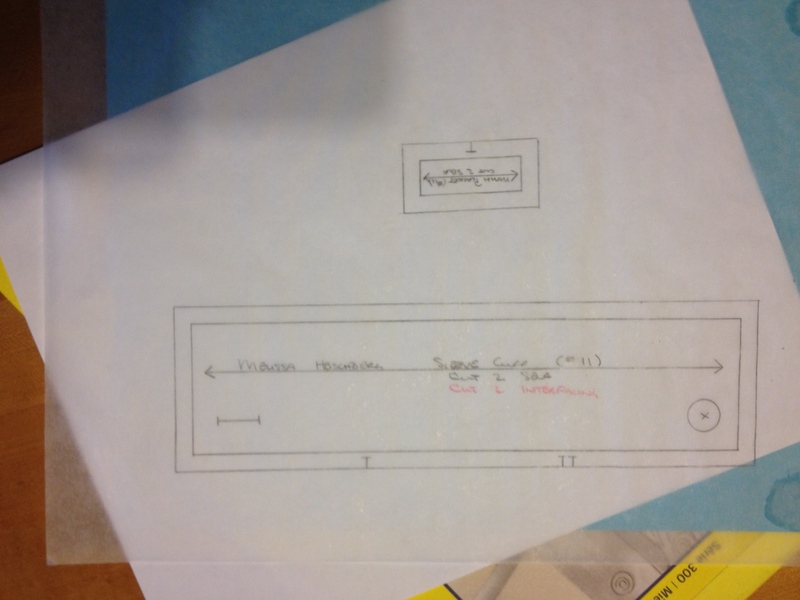 However, our sleeve will have a 1/2″ band at the bottom. That means that this portion of the sleeve has to end 1 1/2″ above the elbow. Square a line straight across. To make our sleeve poofy, we have to add extra fullness. 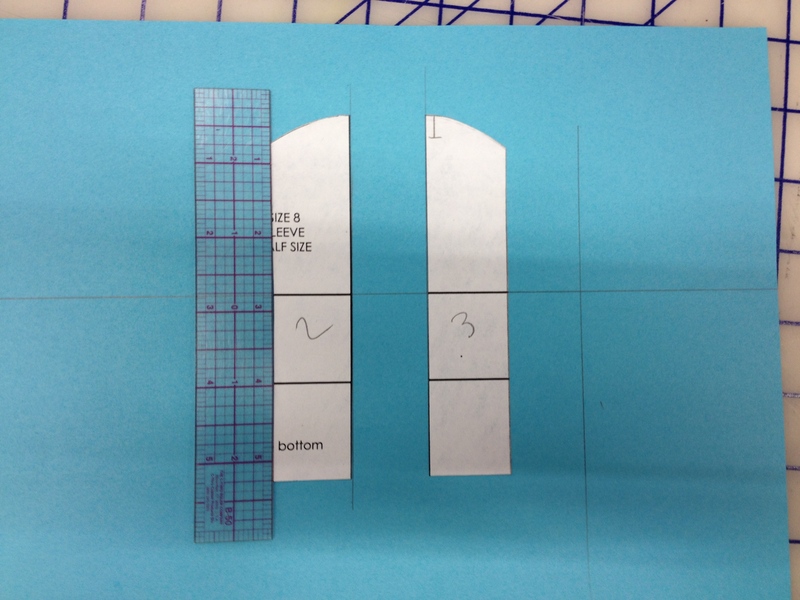 We’re going to cut the piece into strips and space those, like we did in the fullness sample. 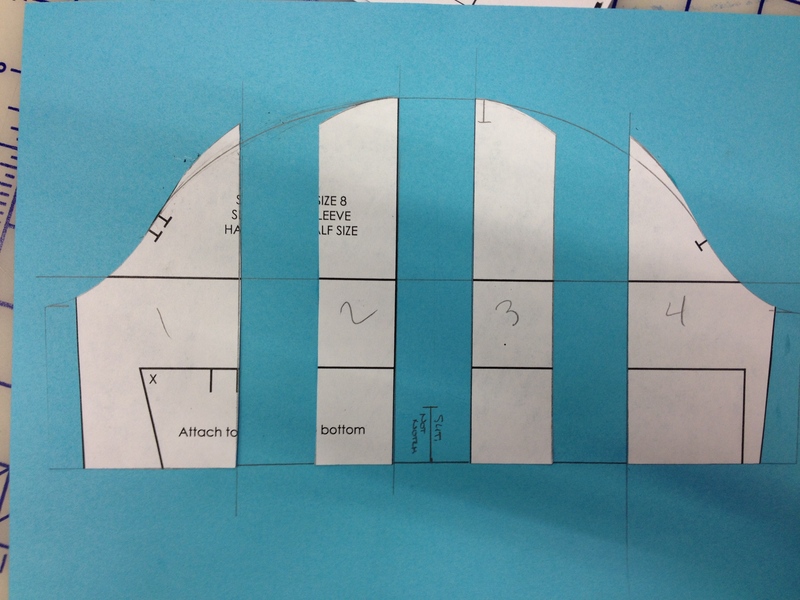 We will be dividing the sleeve down the center line, and midway between the center and the notch on each side. We will use our horizontal balance line to make sure we place the pieces correctly. Make guides on your colored paper. The horizontal one will let us line all the pieces back up, based on their horizontal balance lines. The two vertical lines are absolutely square to that. The distance between them is the amount of fullness we’re adding at the center of the sleeve: 1″. Before I cut my sleeve apart to add fullness, I number the pieces from left to right. It’s a good habit, and will help when you get into more complex pieces. Place pieces 2 and 3, using the guidelines. Make new guides on the outsides of pieces 2 and 3. These will be the extra fullness between pieces 1 and 2, and 3 and 4. We used 1″ for this. Place pieces 1 and 4. You will need to redraw the sleeve head as smooth curves. 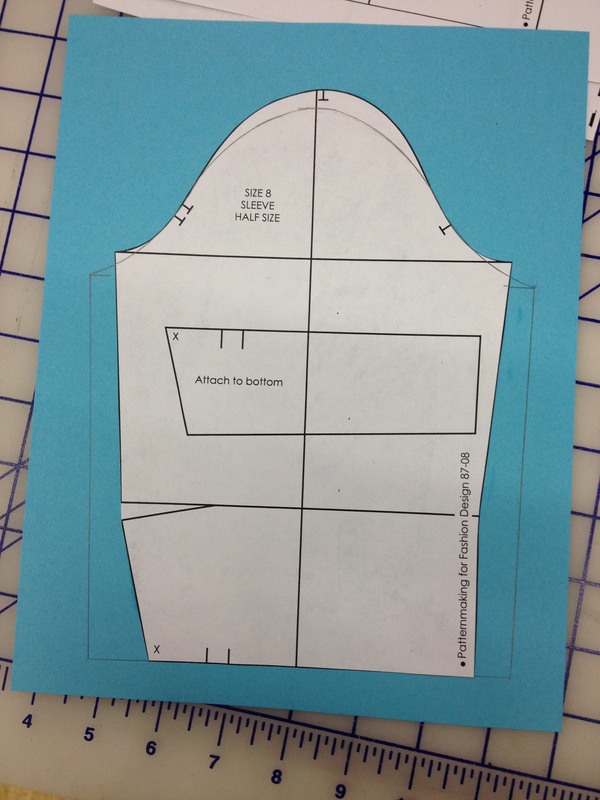 Our plan calls for a buttoning band and a placket at the center of the sleeve. To mark in the placet, we are going to make what looks like a very long notch at the center of the sleeve. The line is 3/4″ long. 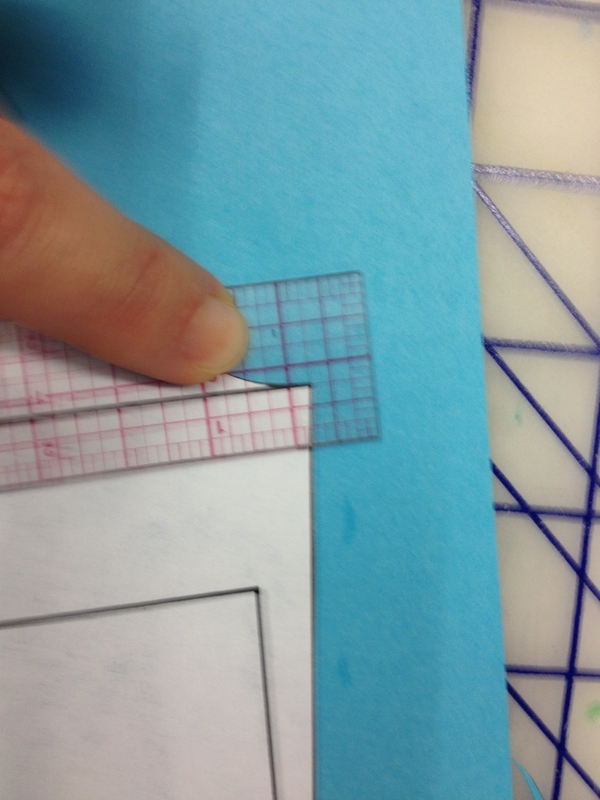 This is why it is important to only mark notches in the seam allowance. Anything that looks like a notch screams “Cut on this line, right up to the little cap at the end!” You don’t want to send that message inside your pattern if you’re not serious about having a cut there. You will also need notches to help you put the sleeve into the armscye. The shoulder notch started out 1/8″ to the front of our sleeve. Mark a guideline at the center of the sleeve (between pieces 2 and 3), and add a notch 1/8″ towards the front of the sleeve. 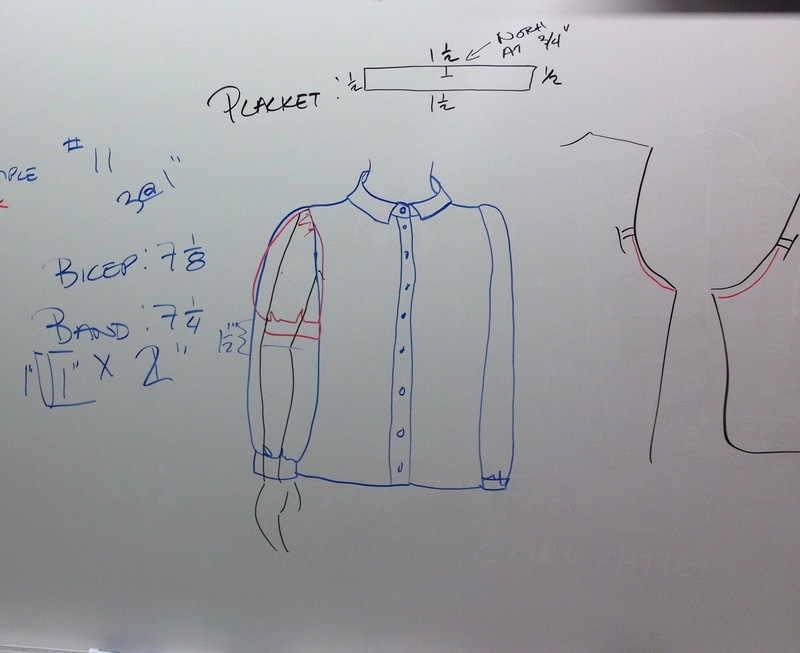 Here are our class notes, with the new sleeve shape (red) as well as the information on the size of the lower band and the placket. 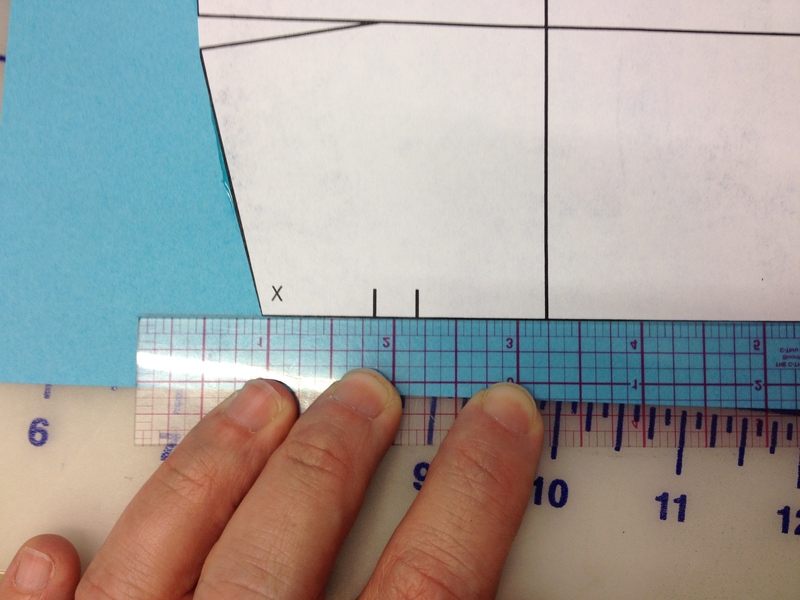 Our block’s bicep measurement was originally 7 1/8″. This already includes a little bit of ease. We are using 7 1/4″ for our band measurement. We plan to use this band with a 1/2″ button. This band will take up 1″ on the arm, but it’s folded up at the bottom so that there’s no raw edge and no hem. 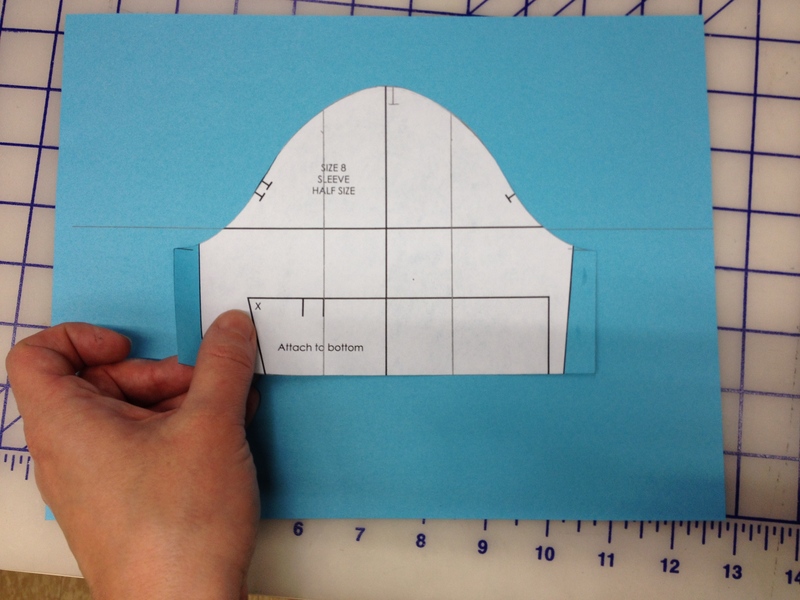 Our tiny little placket is also a rectangle, 1 1/2″ long (2 x 3/4″) and 1/2″ wide, with a notch at 3/4″. 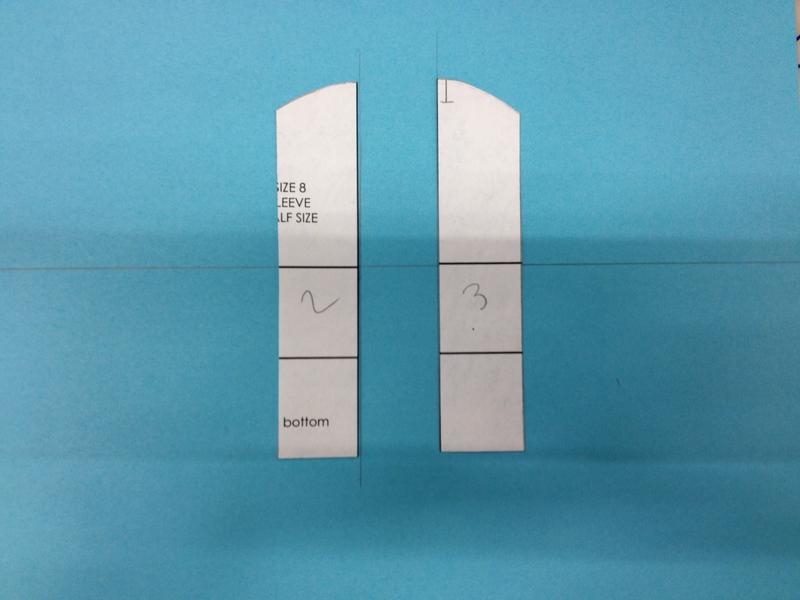 The notch indicates the end of the placket slit, and the 1/2″ width gives us a finished folded band that is 1/4″ wide. 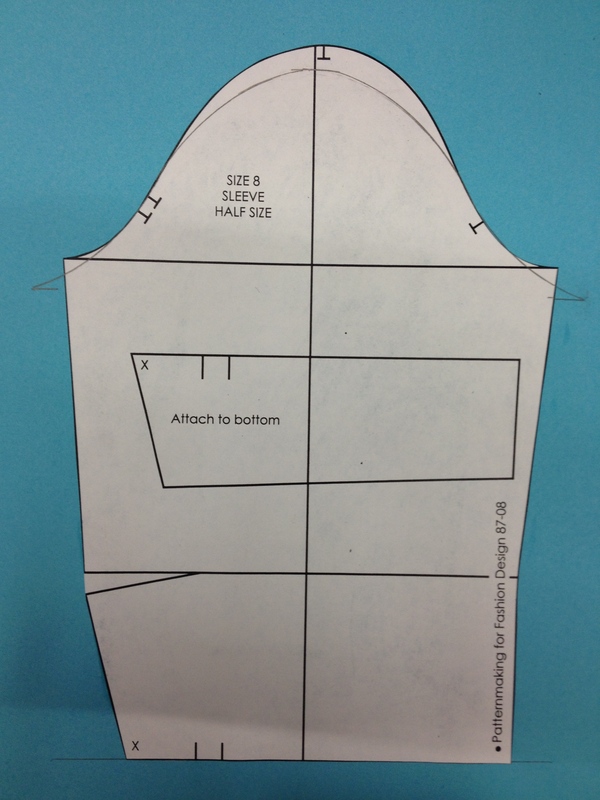 Finished sleeve pattern, with bottom notches for band placement and placket indicated. Finished placket (top) and band (bottom). 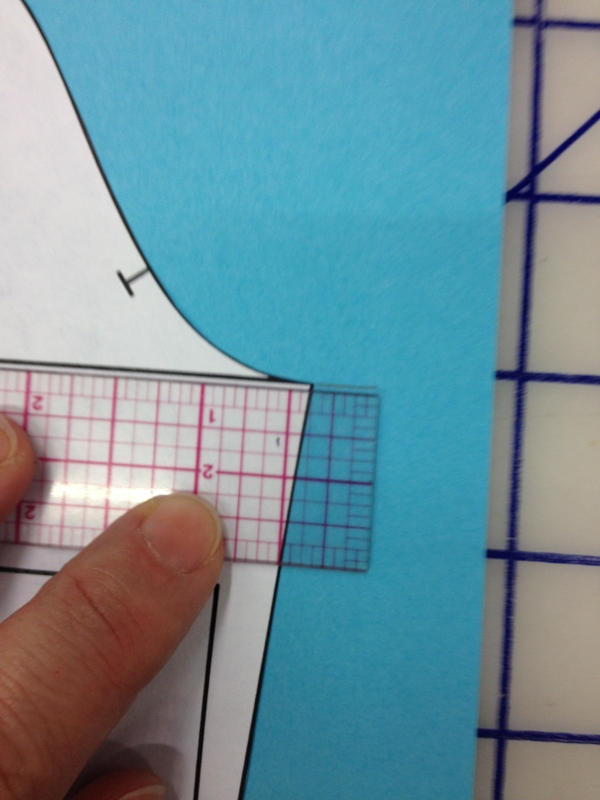 The placket notch indicates where you’ll turn while stitching (ie, the end of the slit). The notches on the band will help us line it up with the sleeve. I’ve been following your series with interest and wanted to ask if you have any suggestions/links/historical examples for those who do want to add some extra fullness under the arm, without looking too awkward to the modern eye? As a woman with ‘statuesque’ shoulders binding in the upper arms is one thing I hit too often (and thus nearly always opt for puff sleeves). Hi, Myth – Thanks for following! I’m hoping to start a series of historical black drafts, after I finish work on *dumdumDUM* a new block. ;) For the vast majority of body shapes, you don’t want add fullness under the arm. Where the extra fullness of your arm is, exactly, will determine what you want to do. Tf the fullness starts in the shoulder itself (ie, above the arm pit), then first off, I hear ya, sister. That’s one of the first places I have problems. You need extra ease through your sleeve head. 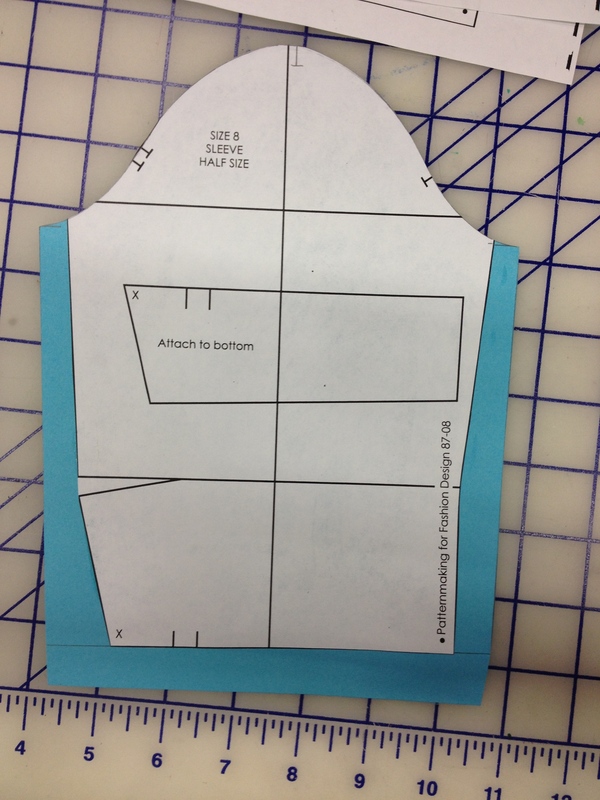 Standard is 1″ (1/2″ or less on cheaply made clothes). Try altering your patterns to include 2 – 2 1/2″ (slash and spread the sleeve head, as we did in this post, and fade into the arm). That’s a lot of ease, so you’ll probably need to start you ease stitching 3/4 – 1″ before the normal notches. If you’re normal through the shoulder, and the fullness of your arm is mostly in the tricep area (“wings”), the sleeve head may be fine. You’ll need to widen the sleeve through the upper arm – again, find the offending section of sleeve, slash it and spread it, and fade back in to the rest of the sleeve. Hope that helps! Wow! Thanks, Lucia – it’s going to take me a while to work through that one! I figured I’d defer working through until I have a bodice well established. One needs a good armscye. But you can see that he’s working through the pattern literature and the engineering literature to try to do something a bit more holistic. So, he has a big literature review about all the sleeve draft recommendations pointing out similarities and differences. Then he works through geometry to get zero ease sleeves– also discussing how arm movement and biceps width on the draft interact with the crown. Then afterwards, he adds ease in the cap, relating that to how the cap actually looks in terms of rising ‘up’ — if that’s the word– relative to the no ease sleeve.